Every day in Colorado, innocent people are severely injured because of the negligence of others. These injuries occur from car wrecks, defective products, slip and fall accidents and a host of other causes. If you’ve been hurt and are facing costly medical bills, pain and suffering or the inability to earn a living, compensation isn’t a luxury, it is an absolute necessity. You need determined, experienced personal injury attorneys in your corner. At the Frickey Law Firm, we are passionate about helping injury victims heal and move forward with their lives. Call 303-237-7373 now for a complimentary consultation. We will happily listen to your story and assess the merits of your case free of charge. We proudly serve clients throughout Colorado, including Denver, Boulder and Lakewood. The personal injury lawyers at the Frickey Law Firm help clients whose lives have been affected from all types of personal injuries. If you have been harmed due to the negligence of another, you may be entitled to compensation for your injuries. We can evaluate the strength of your claim and advise you on how best to move forward. The term catastrophic injury describes injuries that permanently affect the lives of victims and their loved ones. These injuries involve long-term or permanent disability and disfigurement. Lawsuits in these types of cases must pursue higher amounts of compensation because the life of the victim is forever changed, and may result in years of physical, financial and emotional challenges. Whether they are physical or mental, long-term disabilities can prohibit you from working, require costly medical treatment and put a considerable strain on your closest relationships. You may need to take certain medications for the rest of your life or make expensive alterations to your home to accommodate a wheelchair or other assistive device. If you’ve been severely disfigured, the mental distress can take an enormous toll on your ability to maintain a job or relationship. You may even be afraid to go out in public. In addition to your emotional turmoil, medical treatments for disfigurement injuries such as amputation, chemical or fire injuries can be incredibly expensive. You shouldn’t face these hardships alone. Contact the Frickey Law Firm today to discuss your case for free. Your back is a complex, sensitive network of nerves, muscles, tendons, bones and ligaments. It’s easy to harm one or more of these interconnected systems in any number of ways. Our injury attorneys have seen countless clients who’ve hurt their backs in horrible accidents over the course of our six-decade history. Your back affects so much of your daily life, from the basic ability to walk without pain to your ongoing ability to perform your job duties. Back issues are some of the most common personal injuries experienced by our clients. We understand how these injuries affect you today and in the future. Our knowledgeable personal injury lawyers can help you seek the full and fair compensation you deserve. Traumatic brain injuries are injuries that result from a blow or trauma to the head or neck. While open-head trauma occurs when a wound penetrates the skull, closed-head trauma doesn’t display any obvious external damage. Traumatic brain injuries are often not immediately obvious. They can take days or even weeks to manifest. This can be very dangerous, because it is crucial to get your TBI diagnosed and treated as quickly as possible. An isolated headache or poor night's sleep isn’t necessarily a symptom of TBI. However, if you have experienced trauma and find yourself suffering from multiple, chronic symptoms described above, you may have a traumatic brain injury. Insurance companies are in business to make profits, and they will often do everything in their power to avoid paying injury victims adequate settlements. Without an attorney, you will likely find yourself facing insufficient settlement offers or pushback from insurance providers. A skilled personal injury lawyer knows how to recover fair compensation for your injuries, lost wages and any related property damage, as well as general damages like pain and suffering when applicable. Working with a personal injury attorney can dramatically improve your chance of achieving fair compensation. In fact, according to the Insurance Research Council, injury victims backed by legal representation tend to receive significantly larger settlements than individuals who attempt to negotiate a settlement without legal assistance. Experience with insurance companies: Most people don’t deal with insurance providers on a daily basis, but as successful personal injury attorneys, we do. We know the tactics used by insurance companies to delay, devalue or outright deny your claim. We also know how to build your strongest case and seek the maximum compensation you truly deserve. Legal knowledge: It’s important to work with a lawyer who focuses on personal injury cases and has thorough knowledge of the specific laws that apply to your situation. For more than sixty years, our firm has protected the rights of countless clients. By focusing exclusively on personal injury law, we can provide exceptional legal representation in a comprehensive range of case types. Medical knowledge: Your attorney should have a detailed understanding of accident-related injuries and the corresponding costs associated with immediate treatment, rehabilitation and long-term care. At the Frickey Law Firm, our attorneys possess a wealth of knowledge and experience, as well as a depth of resources, including respected medical experts. Courtroom experience: The best personal injury lawyers can skillfully negotiate with insurance companies to achieve fair settlements, but they must also have the trial experience necessary to take your case to court if a settlement offer is inadequate for your needs. Our attorneys have extensive litigation experience and we never back down from a fight. Finally, your attorney should make you feel comfortable and provide peace of mind. A good personal injury attorney will be up-front about legal fees and court costs, clearly explain the process, establish expectations, and help ensure you receive the care you need. 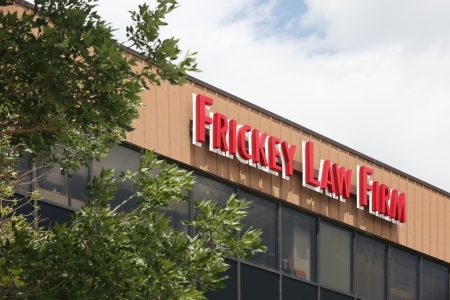 At the Frickey Law Firm, you aren’t just another case number, you’re our top priority. We know what a difficult time this is for you and your family, and we will handle every aspect of your case with honesty, compassion and integrity. A statute of limitations is the timeframe you have to bring legal action against another person or entity. In Colorado personal injury cases, different statutes of limitations apply depending on the circumstances surrounding the injury. For example, the deadline to file a claim related to injuries from a motor vehicle accident differs from the time period related to medical malpractice injuries. However, different timeframes apply to motor vehicle accidents and events that result in wrongful death. There are also some exceptions, including extensions related to when the injury was actually discovered. Don't delay: Contact Frickey Law Firm about your case today! With so many variations and exceptions, it is absolutely crucial that you contact the Frickey Law Firm as quickly as possible following your injury. Our experienced and knowledgeable attorneys will evaluate your claim for free and determine if your case falls within the statute of limitations or qualifies for any exceptions or extensions. Most reputable personal injury law firms provide representation on a contingent-fee basis. Simply put, this means you pay nothing unless you receive a settlement or court award; legal fees and other expenses are reimbursed at the conclusion of a successful case. At the Frickey Law Firm, we work diligently to keep your costs low while providing the highest level of attention. We also provide you with a detailed accounting of all fees and related expenses through our straightforward contingent-fee agreement and disclosure statement. If you’ve been hurt in an accident, don’t let the clock run out on the justice you deserve. Contact the Frickey Law Firm today online or at 303-237-7373 to discuss your case for free. We help injury victims throughout Colorado, including Denver, Boulder, Lakewood and other nearby communities.